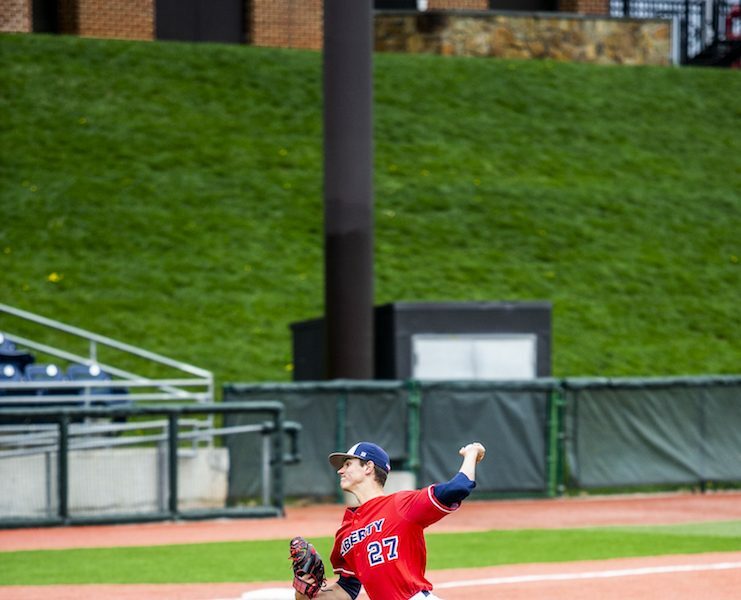 The Liberty Flames baseball team beat the bad weather to close out a three-game series Sunday afternoon with a 15-4 win over the Stetson Hatters. 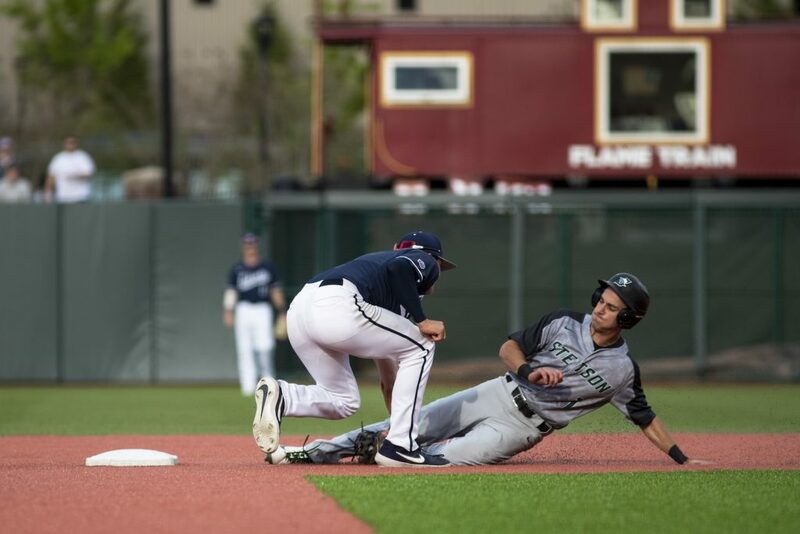 The Flames had a season-high 22 hits, and sophomore infielder Will Wagner had four of those hits and extended his streak of RBIs to nine out of his last 10 games. The Flames took control of the third game quickly, Joseph Adametz pitched six innings for the Flames and gave up just one run while throwing a mixture of strikes and curveballs. Then in the seventh inning, freshman Logan Barker came out and threw strikes and only one ball in the course of two innings. Shortstop Cam Locklear also hit three of the 22 hits in Sunday’s game. In the second game, Locklear hit a home run which paved the road that led the Flames to victory in the second game. Stetson scored three runs in the top of the ninth, but they could not catch up to the Flames, with the game ending 15-4. Sacrifice flies kept Liberty in the ballgame, and a sacrifice fly ended up being the deciding run that handed Liberty its third loss in Atlantic Sun play. The game-winning RBI for the Hatters came off the bat of senior outfielder Jacob Koos. Controversy surrounded Guy’s final at-bat of the game. After Guy was hit by a pitch, the umpire ruled that Guy made no attempt to move out of the way. After a replay, this decision stood, and Guy was not awarded first base. Season high — Sunday, April 14, Liberty recorded a season-high 22 hits, three of which were contributed by star shortshop Cam Locklear. The Flames split their double header with Stetson Saturday evening with a 12-6 victory over the Hatters. The victory followed a 3-2 loss earlier in the day, and was the second out of three games against Stetson. Two Flames, shortstop Cam Locklear and first baseman Logan Mathieu, hit home runs to help the team to its victory. Liberty fell behind in the second inning 2-1 after a scoreless first inning, then surged ahead with three hits in the third inning. The Flames were led in the first four innings by pitcher Noah Skirrow, who threw four strikeouts and allowed nine hits. The team made up for any extra hits from the Hatters and maintained their streak into the fourth inning, racking up another three runs from senior Tyler Galazin, sophomore Brandon Rohrer and a home run from Mathieu. 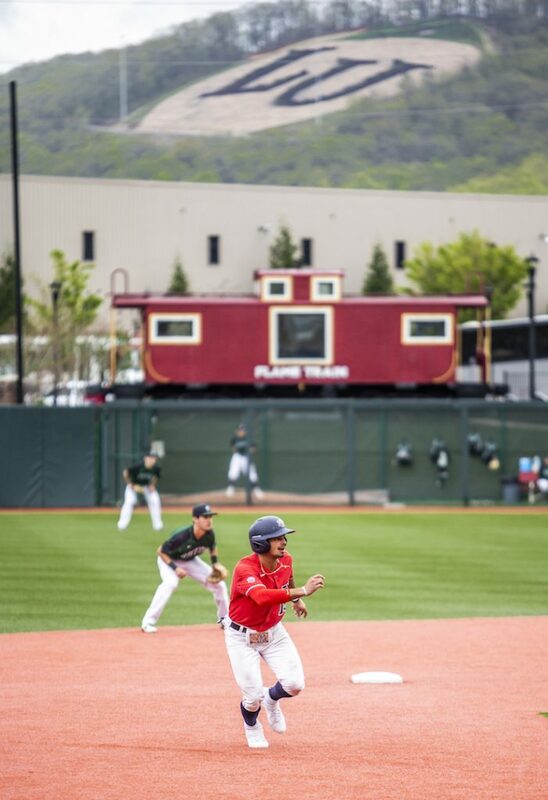 The Flames fully established themselves in the fifth inning when junior pitcher Garret Price relieved Skirrow and threw a hitless five innings. When Price took over, the Flames stood at a shaky 8-6 lead. After that, Price struck out seven batters and kept the Hatters without a single run for the rest of the game. After a scoreless sixth inning, the Flames made their final surge ahead with four runs in the bottom of the seventh. Their runs were from Mathieu, freshman Gray Betts, Locklear and freshman Jaylen Guy. The Flames were led by Mathieu with three runs, followed by Rohrer, Locklear, Betts and Guy with two runs apiece. Series Win — Liberty took two of three games against Stetson this weekend, scoring 12 or more runs in their victories Saturday and Sunday. The Flames had a season-high 22 hits, and sophomore infielder Will Wagner had four of those hits and an RBI in nine out of his last 10 games.